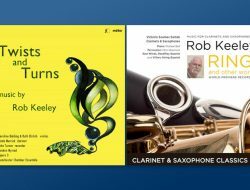 Rob Keeley CD Releases get glowing reception! Ahead of the upcoming premiere of Lullay on 24th March, we spoke to Robert Peate about his new work for solo violin and double string orchestra and the processes behind the work. I had the idea to write a short lyrical piece for violin and strings for a few months, and had made one or two sketches. Then the experience of becoming a father prompted me to write a set of children’s piano pieces. One of these was a lullaby. This modest piece was made largely out of parallel 5ths moving up and down in 3rds, and gradually this idea started to grow in my mind, especially as it seemed to tally with the sound of our son Rowan’s grumbling from his cot at night. Separate to this, I spelt Rowan’s first two initials (R. B.) musically (=D, Bb), and put them next to the outline of a musical spelling of his mother’s name (=A, E). The harmonic exchange of a 3rd by step out to a 5th, when extended over a wider range creates an exchange between piled up 5ths, and a harmony of piled up 3rds which coincidentally match the harmony of the rising and falling 5ths of the lullaby. The piece came together quickly from then on and I used the solo violin as a flexible, lyrical thread which explored and directed the music. The darker edge of some of the piece also comes from those nocturnal, anxious moods, and the music on the whole owes much to the haze of adrenalin, fatigue and emotion that we lived in. Where does the title Lullay come from? The piece was just ‘Lullaby’ originally, but then after coming across the Middle English lyric poem which begins ‘Lullay, myn lykyng, My dere sone, myn swetying’, I felt ‘Lullay’ was better. Why did you choose to divide the orchestra into two? It was through instinct more than anything, but in working on the piece it seemed to suggest a solo violin between two string orchestras in a kind of lulling, or breathing exchange. Also a symmetrical quality governed the music, and so a symmetrical layout felt right somehow. I’ve also written a similar concertino for solo harp and double string orchestra recently (Stone Study no.1 – Wall and Steeple), and have found I like this instrumentation very much. There is of course also a great tradition of double string orchestra music in Britain going back through Tippett and Britten to Vaughan Williams and Elgar, not that I’d want to invite too many comparisons(!) but I’m very fond of these pieces. You wrote Lullay for Laura Rickard and Hereford String Orchestra – how did this influence your approach? As I’ve said it’s quite a personal piece, but it’s also a practical one. Laura Rickard is a young professional violinist and Hereford String Orchestra are a good, non-professional orchestra, and so I tried to gauge the difficulties of the parts accordingly. The solo part is, though often simple, also quite technically demanding and rhythmically flexible in places. Conversely the orchestral parts are, though not easy, of a more accompanying, but still lyrical nature. What musical influences do you think had a bearing on Lullay? I was aware that the piled up 3rds had more than a whiff of Vaughan Williams about it, but this was more of a coincidence than a conscious ‘stealing’, and the context that this harmony is put in is more Peate than VW I think. Having said that, the fact that it connects with such harmonies in pieces like The Lark Ascending (another concertino for violin) or the song On Bredon Hill (a local landmark) does make some sense expressively, especially regarding the idea of beginnings and endings. Dutilleux is another composer I’m influenced by, and perhaps his piece for solo violin and orchestra Sur le même accord, or his violin concerto L’arbre des songes had a background influence. In fact I was also influenced by myself in this piece. Another coincidence between different materials also came about by way of my own Violin Concerto which I finished in May 2016. At the climax of the concerto a savage and overbearing march is juxtaposed with the opposing sound of two sustained notes on the solo violin and then on the violas. These dyads start as a hushed open 5th before moving out by step to a major 7th. This is again in line with the ‘seeds’ for Lullay, and so was in some sense a continuation of this idea, albeit in a quite different context. What would you like an audience to take away from hearing the piece? Generally speaking, on first hearing a piece I think one should simply experience it firstly as abstract music, and any thoughts or references etc one has is down to the individual. I like to think there is more than just a surface impression to much of my work, but I do always try to make a convincing impression on a (attentive) listener initially, and hopefully this invites them to go deeper into the piece. Even if the title was absent I think it’s fairly obvious from the music that this is a lullaby, so of course this is something I’m trying to communicate. Beyond this there are many things to be discovered and explored which hopefully give the music a sense of depth. How do you feel about Lullay now, almost a year after composing it? Soon after finishing it and once we had recovered from the initial impact of having a baby, the piece seemed quite different to me, and I still hear it as something of an emotional time-capsule. Music so often evokes memory, and for me the material and sound of this piece is inseparable from that experience, and probably always will be. Objectively I can see it as sitting slightly apart from my other work in its emotion but also its simplicity. In a way I think it encouraged me to move towards more simplicity in my work, and certainly opened up my interest in using a soloist with double string orchestra as in my previously mentioned Stone Study no.1 (I also have another piece for solo viola and double string orchestra in mind). As with any piece I write, I’m never completely satisfied with it, and that’s part of what keeps me going, but I am pleased with Lullay, and I’m very glad to have written something for my local string orchestra who have been a pleasure to work with. Lullay will be premiered by Laura Rickard and Hereford String Orchestra, conducted by Thomas Payne on 24th March at 7:30 in Holy Trinity Church, Whitecross, Hereford.